Volvos weren't always square. In the '50s through 1976, vintage styles had more rounded bodies—a classic look. Ryan Burmaster had one of his own, a red '66 Volvo Amazon 122s he paid for in cash. It was a great car, but the recession in 2012 made cutting costs seem appealing. So despite the work he put into maintenance and the joy he got from driving a vintage, selling became an option. Burmaster put up a Craigslist ad for the '66 along with a few stray car parts. 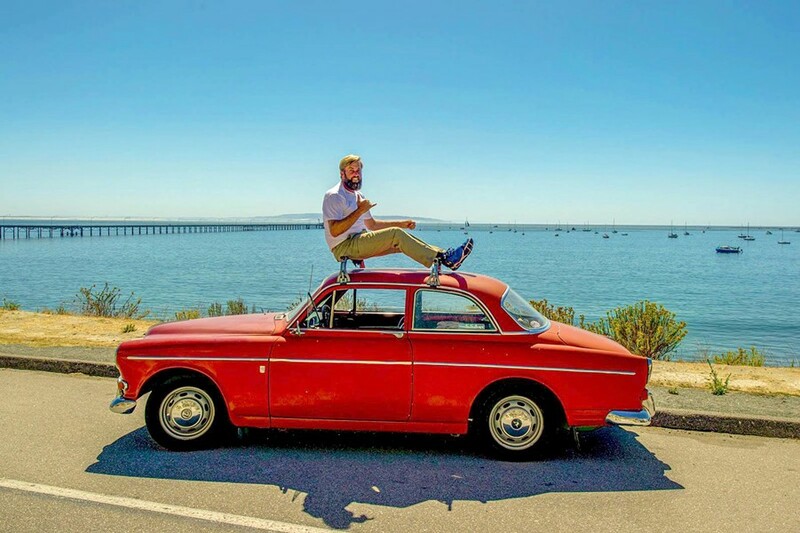 GIVING BACK IN STYLE Ryan Burmaster is president and co-founder of SloRolling, a vintage Volvo group that works on cars and gives back to the community. People interested in buying and selling similar parts reached out from Orange County, Monterey, and Santa Barbara. San Luis Obispo locals reached out as well; they were just excited to hear about someone who had the same car as them. From Burmaster's one Craigslist ad, a group of roughly 10 Volvo enthusiasts met up and quickly decided not to sell their cars after all. They liked them far too much. This is how SloRolling began. They opted to start collecting parts and working on vintage Volvos together. "It was kinda out of necessity; these cars are so old a lot of people won't touch them. So we built up online volumes of reading material and do-it-yourself videos to help out," Burmaster said. "We all started this connection over something that might seem obsolete to many people." A lot of classic cars are deemed "trailer queens" in the vintage world. They stay in a garage, travel to car shows and back, but don't get a lot of practical use. Vintage Volvos are different. SloRolling's "Just Keep 'em Rolling" slogan is indicative of that. These cars are meant to drive. The Part Shed program helps keep them on the road. It's a literal shed that began to fill soon after the group came together; it's stocked with hard-to-find vintage Volvo needs. Members of the group donate parts, and boxes are shipped to the shed from all over the country (and sometimes world) just to help out. Guests pay what they can. "It's on an honest level, everybody gives what they can and takes what they should," Burmaster said. "Those with money tend to donate, people who can pay a fair price do, and for those who can't afford a part, we just give stuff away." The Part Shed program donated an engine to a family in need, assisted a traveler who needed a new hydraulic clutch in less than half an hour, and helped various SloRolling members maintain their cars. "After a while, people were starting to ask if they could donate vehicles," Burmaster said. "That was always outside our capacity, so we said no, but then around three years ago we started saying yes. That was the start of the Kickstart Program, 'Kids In Cool Kars.'" In Burmaster's words, the program is all about passing on the torch to the next generation of gearheads. Since its start, the program has donated 10 cars to minors. The cars aren't in driving condition when donated; a lot of times the "guts," such as the windows and seats, are missing. However, after some mentorship and maintenance, the cars can be fixed up and driven. "We just want to get kids involved and start using their hands," Burmaster said. "Once they put their phones down long enough to mentally get into a problem and start troubleshooting, they grab a hold of that and it opens up their mind to problem-solving skills." People interested in joining the group, donating parts, or referring a child to the Kickstart Program, can email slorolling@gmail.com or visit SloRolling's facebook page for more information. Editorial Intern Ashley Ladin write this week's Strokes and Plugs. Send tidbits to strokes@newtimesslo.com.